USDA Rural Development Area Director Jerry Jolley joined Cannon County Rescue Squad Chief Executive Officer Michael Underhill and Chief Financing Officer Tim Bell in celebrating an $18,000 USDA RD Community Facilities grant and $97,000 loan that was used to purchase a new rescue truck for the county. "On behalf of Rural Development, we appreciate the hardworking rescue volunteers who are from rural areas and know what it means to get just a few dollars to make things happen," Jolley said. "The bottom-line is this Rescue Squad does an excellent job while saving lives, and we hope the organization and surrounding community will benefit from the new rescue truck." The grant paid for a maximum of 15 percent of the project, which is estimated to be about $120,000, along with the low-interest loan to help replace a 27-year-old rescue vehicle. 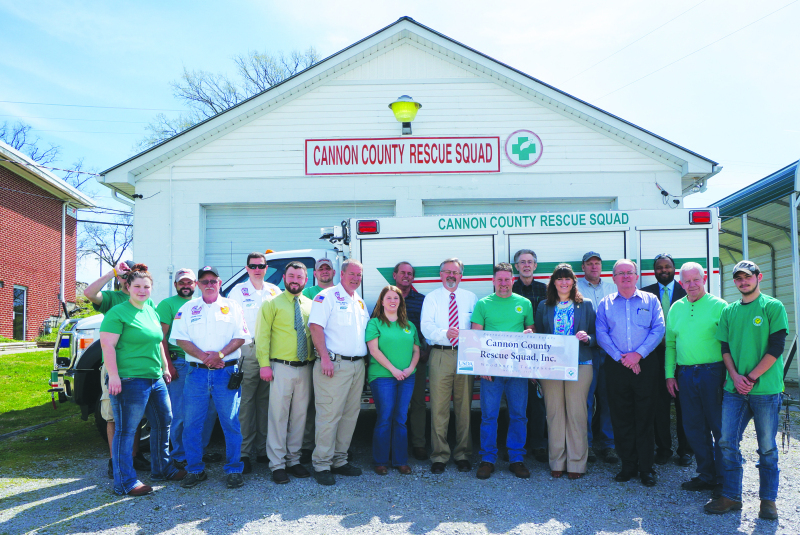 Since 2007, USDA RD has funded Cannon County Rescue Squad three times. Prior funding was used to purchase a rescue truck in 2008 and new rescue equipment in 2013. Others participating in the event include Sen. Lamar Alexander Field Representative Evann Freeman, Rep. Diane Black Field Representative Emily Buck, Town of Woodbury Mayor Harold Patrick, Cannon County Executive Mike Gannon, USDA RD Loan Specialist Chris Hampton, USDA RD Loan Specialist Alice Wills and USDA RD Public Affairs Specialist Thanh-Thanh Pham. USDA Rural Development is moving investments to rural America with housing, business and infrastructure loans and grants to create jobs and strengthen rural economies with an emphasis to assist areas of persistent poverty. Since 2009, the agency has assisted more than 1.5 million Tennessee families and businesses in 230 communities in all 95 counties of Tennessee, investing more than $6.6 billion through affordable loans, loan guarantees, and grants. For more information on USDA Rural Development programs available in Eastern Tennessee contact the Cookeville Area Office at 931-528-6539 x 2. Visit us online at www.rd.usda.gov/TN.